The parish of Happisburgh is located on Norfolk’s northeast coast, about 7km east of North Walsham. It is reasonably large, with Happisburgh beach forming its northeastern boundary. Happisburgh village is located in the centre east on the cliff top, with the hamlets of Happisburgh Common, Whimpwell Green and Cart Gap in the south and the hamlet of Walcott and Ostend on the cliff top in the north. Isolated farms and houses include Hall Farm and Manor Farm. The archaeology of Happisburgh has been thoroughly studied and sites are recorded throughout the parish. There have been plenty of stray finds, many as a result of the severe erosion that affects Happisburgh’s cliffs. A considerable amount of metal detecting and fieldwalking has taken place, a few excavations have been conducted and numerous sites have been identified on aerial photographs, including many recorded by the National Mapping Programme. Site visits have also been undertaken and some historic buildings survive. One of the most important Lower Palaeolithic sites (NHER 35385) in northwestern Europe has been found on Happisburgh Beach. In March 2000 a handaxe was found in situ in a Cromer Forest Bed deposit. Excavations followed and to date over thirty flint flakes, butchered animal bones and plant remains have been recovered from what appears to be a lithic working and kill site. Although the exact date of the artefacts is uncertain, the deposits date to between 500,000 and 700,000 years ago, making the site one of the earliest known in northwestern Europe. Seven other Palaeolithic handaxes are recorded. Five of these were found on the beach, one may have come from the beach and one was discovered in situ in a gravel deposit in a cliff face. Prehistoric flint artefacts have been discovered throughout, with many collected on the beach or from cliff slumps. They include a Mesolithic or Neolithic blade, a Neolithic fabricator, six Neolithic polished axeheads, a Late Neolithic or Early Bronze Age axehead and flakes, scrapers and pot boilers of general prehistoric date. Bronze Age metal objects have been found at several sites and include one or two chisels, a sword (NHER 18519) and two axeheads. Iron Age pottery has been found close to Happisburgh Lighthouse and an Iron Age strap fitting or harness mount (NHER 39729) has been recovered close to Walcott. Nine ring ditches, two double ring ditches and one double or triple ring ditch have been identified on aerial photographs. Ten of these are located in a broad east to west strip south of Happisburgh village, with one north of Walcott Green (NHER 38691) and one west of Walcott (NHER 38679). All are probably the remains of Bronze Age round barrows, although two could have a modern agricultural origin. Some of the ring ditches to the south of Happisburgh village are located amongst extensive field system cropmarks. These include field boundaries, ditches, trackways and enclosures and are visible around Hall Farm, Upton Way, Whimpwell Green and Happisburgh Common. Although they are undated, they appear to have several phases. One phase is probably Iron Age to Roman, with others probably Roman, medieval and post medieval. Some of the features close to Happisburgh Common (NHER 38725) could pre-date the probable Iron Age to Roman phase. A possible Iron Age to Roman farmstead (NHER 38744) has been identified amongst the field system cropmarks close to Whimpwell Green. Roman pottery and coins have been collected from the site (NHER 17351). Other Roman objects from elsewhere include pottery, coins and a brooch. A rectangular feature on the edge of probable field system cropmarks northeast of Whimpwell Green may be a Roman structure or building, although alternatively it could be medieval or post medieval. Some of the undated pits (NHER 16015) visible on aerial photographs to the northeast of Whimpwell Green could be Early Saxon grubenhauser (sunken featured buildings). Unfortunately, no Early Saxon artefacts have been recovered from the site. A wrist clasp has been collected on the cliff top northwest of Happisburgh village. Middle and Late Saxon pottery has been found at several sites and a pin that is either Middle Saxon or Roman (NHER 37118) and a Late Saxon pinhead have been collected. Two ditches (NHER 38591 and 38592) identified from cropmarks in the south are on the line of Happisburgh’s parish boundary and consequently could be Saxon boundary features. Happisburgh, Walcott and Whimpwell feature in the Domesday Book of 1086, which records freemen, villagers, smallholders, slaves, ploughs, meadow, woodland, pigs, cattle, sheep, beehives, a mill and a church. Happisburgh was held by King William I and Count Alan and was named ‘Hapesburc’, an Old English word meaning ‘the stronghold of a man called Haep’. Walcott was called ‘Walecota’, Old English for ‘the cottage of the Britons’, whilst Whimpwell was described as ‘Wimbweila’. The exact location of the medieval Whimpwell is uncertain, although it is thought that it was not where the modern Whimpwell Green is. It is possible that its site has been lost to the sea. All Saints’ Church (NHER 7090), Walcott is located in a relatively isolated position between Walcott and Walcott Green. It was built around 1427 and was restored between 1854 and 1877. An earlier church on the site is probably the one that was recorded in the Domesday Book. St Mary’s Church (NHER 7091) is on the eastern edge of Happisburgh village and is about 150m from the cliff edge. Most of it dates to the 14th century, with restoration work carried out during the 15th, 19th and 20th centuries. The tower may include 11th to 12th century features. Two pieces of medieval stonework found in Happisburgh village may have been part of a cross (NHER 14149). Close to their findspot is The Monastery (NHER 12471), a hall house that was built around 1500 and that has been altered and extended since. It may have once belonged to Wymondham Abbey, possibly serving as a monastic grange. A ring ditch to the south of the village may be the site of a medieval or post medieval windmill (NHER 38756). Aerial photographs suggest that several disused medieval or post medieval roads (NHER 38695, 38698, 38772, 38773 and 38777) converge on the village. Other disused roads or trackways of similar date have been recorded near Hall Farm, Whimpwell Green and Walcott Green. Undated pits (NHER 38732) close to the Hall Farm road may be medieval to post medieval extractive pits. A medieval moat (NHER 8244) survives at Manor Farm, Happisburgh Common. Medieval bricks, tile and pottery have been collected and a medieval flint-lined well was discovered by a farmer inside the moat. It is possible that there were fishponds to the south. To the west of Walcott Green probable medieval and post medieval enclosures, pits and a possible structure (NHER 38762) are visible on aerial photographs. In 1947 two wells (NHER 7085) were exposed in a cliff face close to Ostend. In the following year one was excavated and 13th century pottery was recovered. In 2000 a post medieval well (NHER 34949) was observed in the cliff face beside Happisburgh village. A piece of medieval stonework was recovered from it before it was demolished on safety grounds. Post medieval buildings in the parish include Manor Farm, Hill House Hotel, Baldwin’s Farmhouse, Holly House, White’s Farmhouse and barn, Church Farmhouse, Lower Farmhouse, Thrums, Malthouse Farmhouse, St Anne’s and Happisburgh Manor. The farmhouse at Manor Farm (NHER 16969) was built in 1588 and is probably the earliest. It is accompanied by several 18th/19th century barns and one of possible 16th century date. Ostend House (NHER 36222) was a small 16th or early 17th century house, but by 2001 it was derelict and under threat from cliff erosion. It was demolished as a result. Both Happisburgh Manor and St Anne’s were designed by Detmar Blow and built in 1900. The gardens around Happisburgh Manor (NHER 14148 and 35383) include a hedged tennis court, a brick floored terrace, summerhouses and a kitchen garden. The kitchen garden merges with the garden of St Anne's (NHER 24941). Two lighthouses are marked on the cliff top on Faden’s map of 1797. The southernmost of these (NHER 15435) probably collapsed during the 19th century and by 1980 sections of it were visible in the cliff face and on the beach. 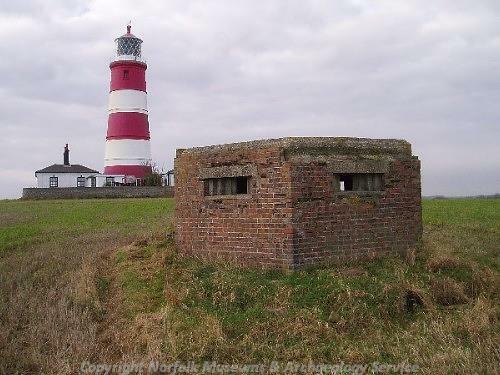 The northernmost still stands about 300m from the cliff edge and is known as Happisburgh High (NHER 7092). It was built in 1791, is five storeys tall and is currently painted red and white, although during World War Two it was painted in a camouflage pattern. Despite the presence of the lighthouses on 27 July 1807 a Revenue cutter called Hunter (NHER 18662) was wrecked. The bodies of its crew were washed up at Waxham. Structures visible on the beach on 1940s photographs could be wrecks. Faden’s map also shows the site of a windmill (NHER 11877) to the south of Whimpwell Green. This building was constructed in 1773 and was dismantled in 1920. An earlier post mill on the site was blown down in 1770. During the 19th century there were two brickworks in the parish, one south of Happisburgh village and one at Walcott. The first has been abandoned, the second lost to coastal erosion. In the 19th century a breakwater (NHER 39200) was built on the beach adjacent to Happisburgh village in an attempt to provide defence against erosion. Concrete blocks visible on 1940s aerial photographs of Ostend beach may also have been designed as sea defences. During World War Two the parish was heavily defended. 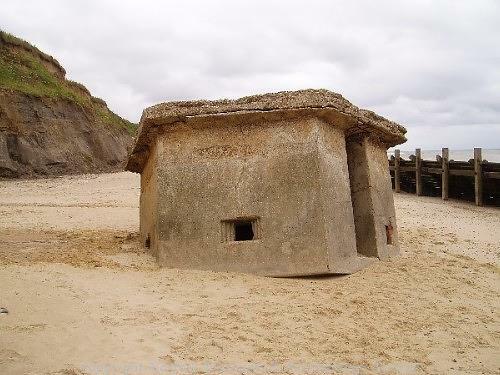 In 1940 a 6 inch coastal battery was built on the cliff top at Happisburgh village, with gun houses, an observation post and barbed wire obstructions. It was abandoned the same year, when a 4.7 inch coastal battery was built to the northwest. Some structures from this survive, including two gun houses with underground rooms, a pillbox and spigot mortar pedestals. These structures, a battery observation post, artillery searchlights, buildings and barbed wire obstructions are visible on aerial photographs taken during the 1940s. During the Cold War the Royal Observer Corps used the site and an Orlit post was built. During World War Two there was an anti aircraft battery (NHER 38792) and a radar station (NHER 14147) to the east of the second battery. In the event of an invasion, the beach and cliffs would have served as the first line of defence. Barbed wire obstructions, anti tank scaffolding and anti tank blocks were put up in several locations, some with associated pillboxes (NHER 15594 and 15917 for example), slit trenches and in one location a heavy machine gun pillbox (NHER 16971). In the southwest two anti tank ditches were dug (NHER 38588 and 38747). The westernmost one was joined to an existing watercourse that was dredged, with the upcast material banked up to extend the defensive line southwards to Lessingham. Pillboxes were also constructed at locations inland from cliffs to provide secondary defences, such as to the west of Walcott. The parish was attacked from the air during World War Two and St Mary’s Church was damaged during a bombing raid. Bomb craters (NHER 38699 and 38700) are visible around it on 1940s aerial photographs. David Robertson (NLA), 12 May 2006.
http://www.happisburgh.org/. Accessed: 12 May 2006.
http://www.norfolkchurches.co.uk/happisburgh/happisburgh.htm. Accessed: 12 May 2006.
http://www.norfolkmills.co.uk/Windmills/happisburgh-postmill.html. Accessed: 12 May 2006.
http://www.britarch.ac.uk/ba/ba86/index.shtml. Accessed: 12 May 2006.